Remember the wedding of Prince William to Kate Middleton with this stunning 3 piece jewellery collection. Inspired by the engagement ring originally worn by Princess Diana this enchanting set will allow you to commemorate this historic occasion in style. 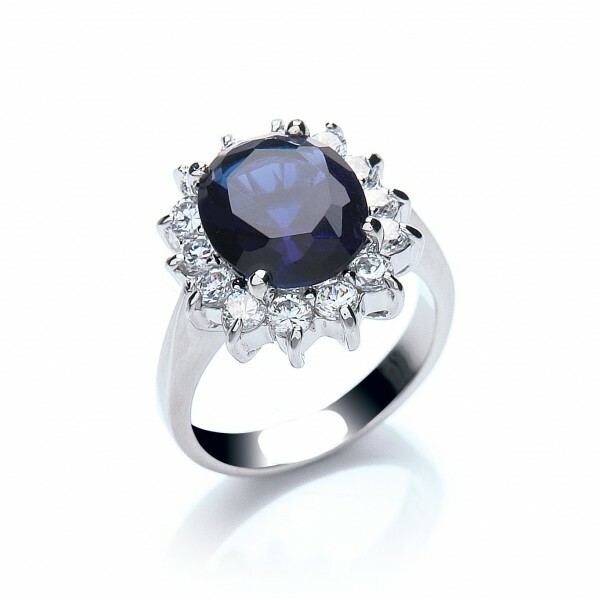 Each piece contains a delightful hand set sapphire simulant as its centrepiece exquisitely framed by up to 14 pristine hand set cubic zirconias, a high-quality addition to any jewellery collection. Matching pendant (CZGN230) and earrings (CZE975) are available. The centre stone measures 12mm X 10mm surrounded by 14 X 2mm clear cubic zirconia stones. The Royal Celebration ring is available in sizes small (UK size L), medium (UK size O) and large (UK size Q), please ensure you select a size. View our ring size conversion guide.